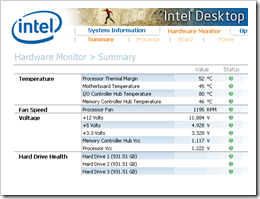 I finished building my Windows Home Server, and it’s running like a charm. It’s not pretty, but it’s functional. 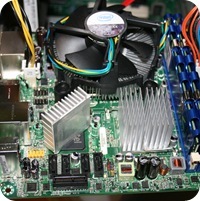 The DQ45EK mini-ITX board was chosen because of the the location of the CPU socket on the board. 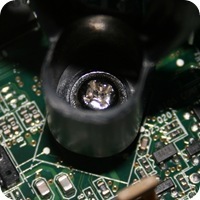 It allowed the installation of a large heat sink in the middle of the board yet making the assembly very compact. The orientation of the components also allowed air to be directed from the front to the back passing major heat-generating components. This allows very effective cooling with one 140mm fan. I’m pleased to say that results are very promising. 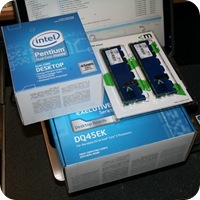 I bought two mushkin 240-Pin DDR2 800 (PC2 6400) (Model 996533) sticks, but they caused some memory problems on this board. Whenever I transferred large amounts of files (tens of gigabytes), it would result in BSODs. Luckily, I had two sticks on a desktop that I ended up using. 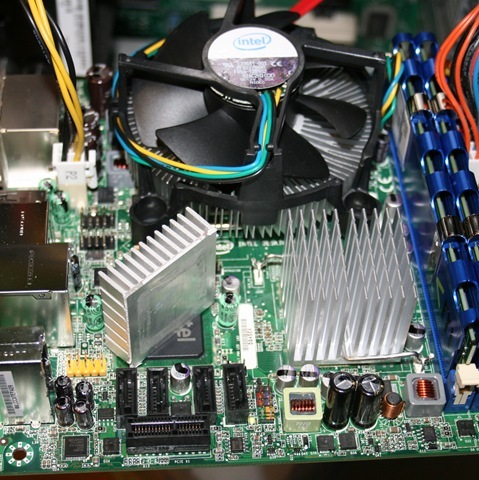 The Intel Pentium E5200 included a heat sink with a fan, and was used for my preliminary setup. The included mounting kit did not want to go on without modification. I made several attempts to install it, but the motherboard was bent beyond what I thought was comfortable. The only choice was to clip off the plastic fasteners, and screw the mount directly with some stand-offs on the underside of the motherboard. 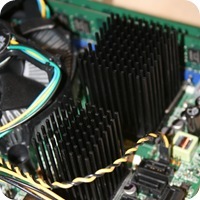 I also had an extra chipset heat sink that I used temporarily on the ICH chip. It was still getting very hot so I ordered two passive chipset heat sinks. One had to be sawed to size, and the other needed some pins removed for the retaining clip. There were no place to put retaining clips for the ICH chip heat sink so I used some thermal adhesive epoxy to keep it in place. 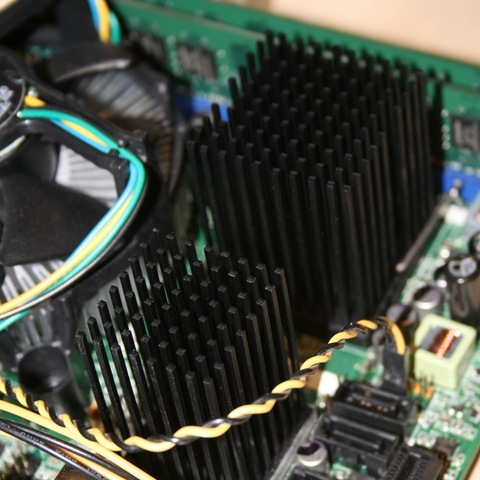 The fins on these heat sinks are tall making effective contact with the cool air from the fan. Here’s the Ultra-120 Extreme mounted onto the board. I made a structure out of Aluminum to support the hard drives. 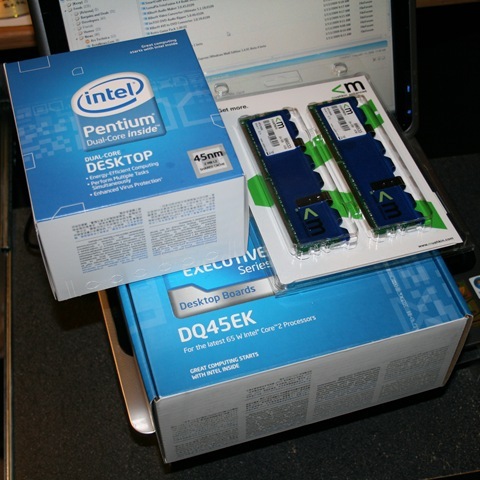 Four SATA drives fit perfectly in the space, but only 3 are being used by the server. I installed a fourth for testing. 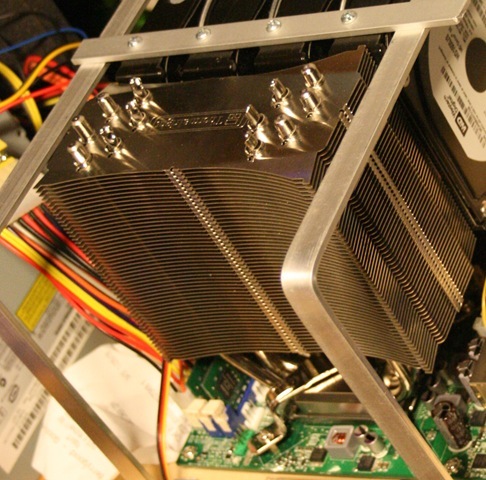 The Scythe SY1425SL12M 140mm case fan proved more than enough to keep the server cool. 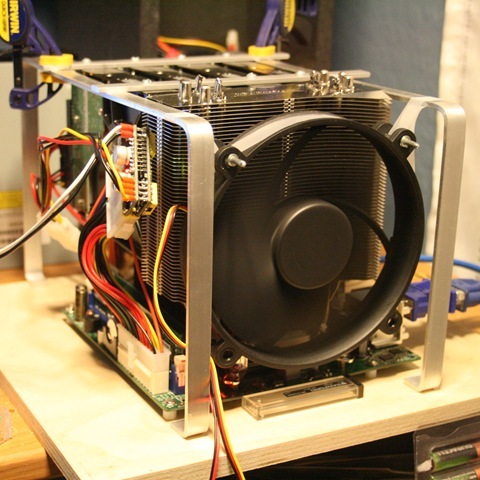 It can actually run without being actively cooled, but I opted to slow down the fan instead, and keep air flowing. 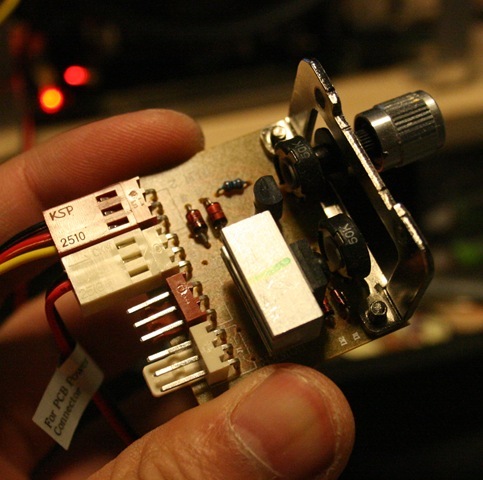 I kept this fan control from an old ATX case, and is now being repurposed for this WHS. 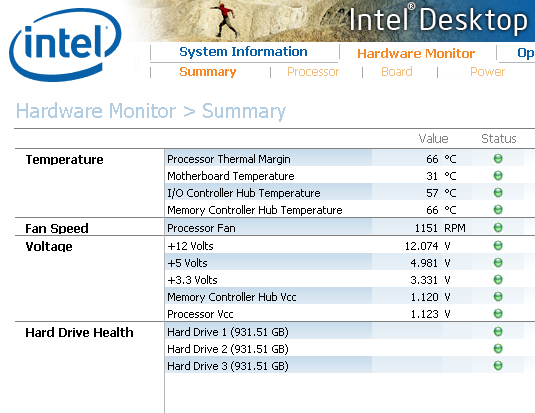 The fan is very quiet, and I can actually hear the hard drives over sounds from the fan. 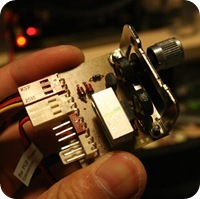 The picoPSU-120 with the 110W brick powers everything. The tiny fan on the brick turns on very rarely. 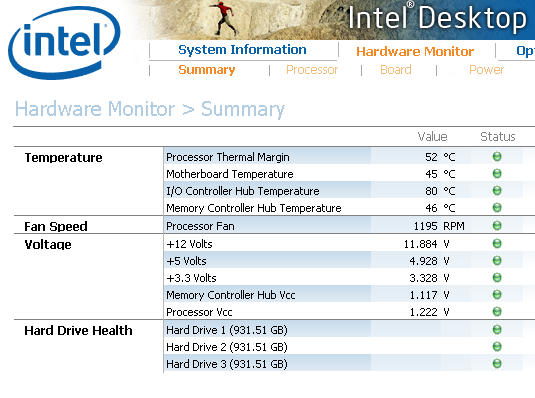 At idle, the server runs at 39 to 40 Watts. With load, it averages around 50 Watts (Measured using Kill A Watt P4400). A potential next step on this project is probably creating a proper enclosure, although the server will be kept in a room rarely seen by anyone.